Are you looking for a fun, no-prep multiplication facts game? 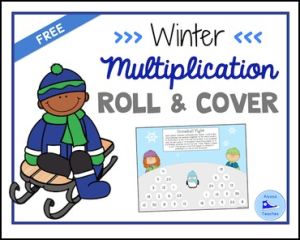 This snow-themed game allows students to practice their 1-6 multiplication facts. All they need is 2 dice and a handful of counters (or dry-erase markers, if you laminate the pages or insert them into page protectors). Students can quickly play a game in just a few minutes and enjoy an easy clean-up with no extra pieces to keep track of.